Another steady step for this consistently larger dividend. Xcel Energy (NASDAQ:XEL) announced today that it is increasing its quarterly dividend by 3.7% to $0.28 per share. "A growing dividend contributes to the total return opportunity we offer investors," said Chairman, President, and CEO Ben Fowke in a statement. "Our objective is to grow the dividend 2-4 percent annually, and this year we are pleased to announce that we have increased the dividend 3.7 percent." Xcel Energy has steadily increased its dividend over the last five years (and before), but an even steeper rise in share prices has pushed its overall yield down from 5.5% in 2009 to 3.5% today. 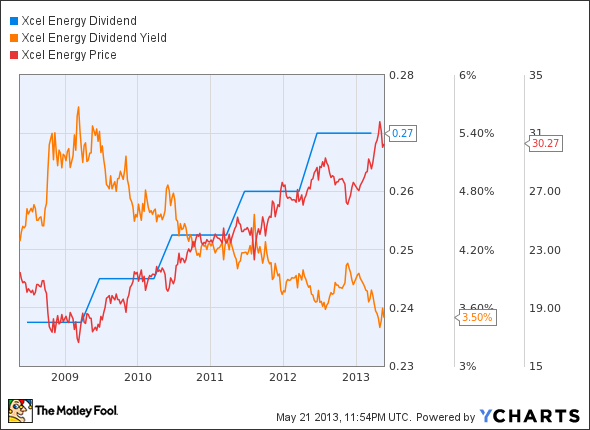 XEL Dividend data by YCharts. The newly improved dividend will be payable July 20 to shareholders of record on June 20.